With delicate razor clams gracing tasting menus at Maison Premiere and Atera, Wylie Dufresne rethinking chowder at Alder, and urban fish shacks and raw bars continuing to proliferate, it’s hard to imagine that the humble clam was ever more fashionable than it is now. In fact, it was: The native bivalve gained popularity in the early-twentieth century after New Yorkers depleted all the local oyster beds, and in 1976 Long Island’s Great South Bay was supplying 700,000 bushels of hard-shell clams a year. Eventually, overfishing and pollution decimated the habitat, and Hurricane Sandy didn’t help. One bright spot on the horizon: Thanks to the restocking of area waters by conservation groups, local specimens have begun returning to seafood shops, farmer’s markets, and New York restaurant kitchens. Here, a guide to buying, shucking, and eating them. On the East Coast, littlenecks, topnecks, cherrystones, and chowders are names for different sizes of the same species of hard-shell clam. Littlenecks are the smallest, typically measuring slightly more than one inch wide across the hinge. These clams are the featured players of raw-bar platters and have a sweet-and-salty flavor. The next-largest size is perfect for pasta sauce, or grilled with butter and garlic on a bed of seaweed, though many old-timers insist on raw, shucked cherrystones. Typically four inches in diameter, these clams may be gruff and up to twenty years old and are, as their name suggests, best dispatched in soups that simmer for hours until tender. Long, thin, brownish shells that look like the handle of an old straight razor. They plant themselves vertically in the sand on the beach like odd pipes and wait to siphon food carried in on waves. Measuring around two inches wide across the hinge, topnecks are popular on the half-shell and are also frequently steamed or grilled. The city’s best clam dishes. 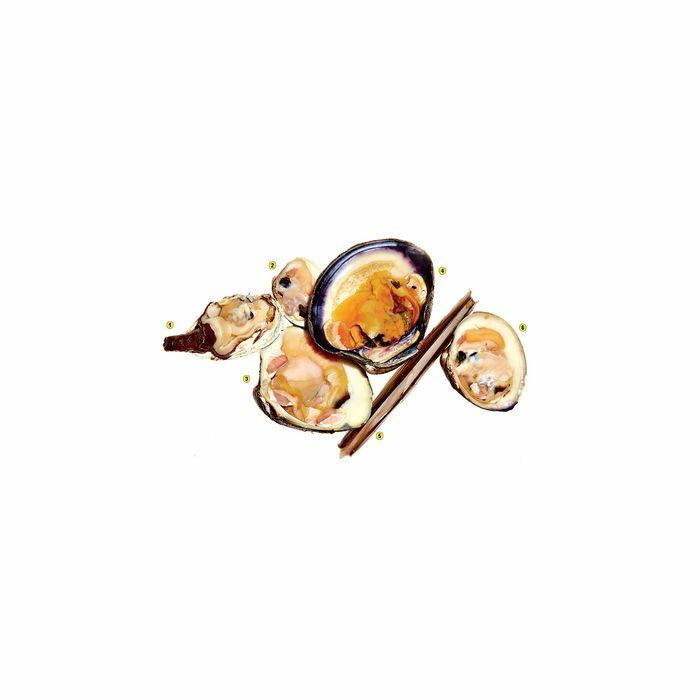 Shucked clams are simmered whole in butter, cream, paprika, celery salt, and Worcestershire, then poured over a slice of toast. The cherrystone version isn’t nearly as famous as its oyster counterpart, but it should be. 89 E. 42nd St., at Vanderbilt Ave.; 212-490-6650. Long Island clams and thinly sliced red Thai chiles are cooked in lager poured directly from a Narragansett tall boy. It does say “Beer of the Clam” right on the can, after all. 288 Third Ave., nr. Carroll St., Gowanus; 718-522-1921. The pasta may not be al dente, but it’s twirled with soft, toasted garlic, then buried under an avalanche of clams and parsley. The broth and the atmosphere are fine at this Brooklyn institution. 2017 Emmons Ave., at E. 21st St., Sheepshead Bay; 718-615-0010. It’s worth a trip to suburban Nassau County to claim a seat at the horseshoe counter of this throwback clam bar where deep-fried bellies are the specialty of the house. 79 N. Long Beach Rd., Rockville Centre; 516-678-3878. Mario Carbone and Rich Torrisi take a new-school sampler approach to an old-school Little Italy staple: Three oreganata-style littlenecks are broiled under a buttery moss of crumbs, three more are cooked Casino style, with bacon, lardo, and red-pepper-spiked butter, and the Fantasia clams are smoked and topped with dollops of sea urchin. 181 Thompson St., nr. Bleecker St.; 212-254-3000. The pale-red broth of this elegant, standout chowder is made from simmered clam juice, tomato, and thyme, omitting the customary carrots in favor of a polite dice of celery and potatoes, not to mention a large helping of tender Rhode Island cherrystones. 210 Spring St., at Sixth Ave.; 212-274-0505. Wylie Dufresne’s new take on the Yankee classic may have logged hundreds of hours in R&D;, but that doesn’t mean this potato-thickened soup, rich with browned bacon bits and meaty clams, is at all overworked. The crispy “crackers” are actually made of dehydrated oysters and taste of the sea. 157 Second Ave., nr. 10th St.; 212-539-1900. These Long Island specimens are grilled and served in their shells with salsa verde. Cooked carefully, razor clams are yielding and meaty, the porterhouse of the clam family. 245 Bowery, entrance on Stanton St.; 212-505-2282. In this stellar Chelsea Market joint production, the grilled ciabatta comes from Amy’s Bread, the tasso ham from Dickson’s Farmstand Meats, and the heaping pile of steamed littlenecks and Manila clams from the Lobster Place next door. 75 Ninth Ave., at 15th St.; 646-568-1223. There’s a choice of vinegars and cocktail sauce in squeeze bottles on the sidewalk, where shuckers work through icy piles so quickly it looks like sleight of hand. 2354 Arthur Ave., nr. 186th St., the Bronx; 718-364-8510. Wash clams in a colander under cold running water, taking care to discard any with cracked shells and those that remain open after vigorous rinsing. Clams that don’t close are dead. If you are right-handed, hold the clam in your left hand with the hinge at the top, parallel with your left thumb. Rest the lower edge of the clam in the center of your palm. (1) Place the blade of a clam knife (we like the three-inch Dexter-Russell S17, available at fishboneknives.com) in the seam just under the C-shaped notch next to the hinge, and press inward. When the blade is halfway between the shells, twist the knife upward to open the clam, holding the top and bottom shells apart in place with the edge of your index finger. (2) Draw the tip of the clam knife into the clam, and run it along the inside of the shell to cut the adductor muscles from the top half. The clam meat should settle into the bottom shell. Use your fingers to continue pushing the top half of the shell away from the bottom half. (3) Loosen the clam from its adductor muscles on the bottom half of the shell. In addition to well-stocked shops like Pisacane Mid Town (940 First Ave., nr. 52nd St.; 212-752-7560), sources for local clams include Greenmarket vendors Seatuck Fish Company, Blue Moon Fish, and P.E. & D.D. Seafood. Some community-supported fishery programs, such as Big City Fish Share (bigcityfishshare.com), offer members clams as a supplement to regular weekly seafood allotments; its add-on clam option costs $18 for two dozen. A $45 weekly share from Rhode Island-based Gabe the Fish Babe (gabethefishbabe.com) buys an assortment of fin fish and shellfish, which might include littlenecks, topnecks, or steamers. *This article originally appeared in the June 24, 2013 issue of New York Magazine.